Katie has ALL THE SUFFERS TODAY. Rayne says "Cheese can be used to mend a broken heart. It's like glue for hearts". Katie, are you EATING A RAW NOODLE? Because kd5mdk and I met up with stillsostrange last week for Coffee and Corgularity. That's ... a lot of corgi. Fuzzy Table for Four, Madame? The orange UT pillow is a beanbag, slippery and smooth and too small for her. So of course, it was The One True Place for a nap, even if it did take her three tries to get it stomped down into the corner of the chair so that she wouldn't slide off of it. And we all know what that means, right? We're talking dogpics, here, people, don't get your hopes up! OK, two more and then I have to get ready to go out with girlpearl for ALL THE WONDERFUL DOVENESS. And there might be Tiny Naked Dog pics. ALMOST AS MUCH AS I LOVE YOOOOOUUUUUUUUUUUUUUUUUU I LOVE YOU SOOOOOOOOOOOOOOOOOOO MUCH ... UM, IS THAT LAMB? JUST ASKING. SO. MUCH. LOOOOOOOOOOOOOOOOOOOOOOOOOVE. ALMOST AS MUCH AS I LOVE YOU I PROMISE I LOVE YOU SOOOOO MUCH IS THAT THE LAMB WITH THE APRICOT BITS MAYBE? CAUSE I LIKE THOSE I LOOOOOOOOOOOOOOOOOOOOOOOOOOVE YOOOOOOOOOOOOOOOOOOOOOOOOOOOOOOOOOU OMG YOU GUYS! She HAD to eat the butter. NOBODY HAS FED HER IN THREE MILLION YEARS, YOU GUYS. LOOK AT THAT TRAGIC STARVED BEATEN LITTLE FACE. SHE WAS FORCED TO CLIMB THE TREACHEROUS SLOPES OF THE MATTERHORN IN A HOWLING BLIZZARD ONTO THE TABLE IN SEARCH OF SUSTENANCE. TO SURVIVE. Let's call this a thought experiment, shall we? d) a half pound of butter. 2) Via a brief and apparently largely harmless stay in the front half of the corgi, the bulk of the butter has been transferred from a plate on the table to the above. 3) You would like to remove the second-hand butter from the above items. Hot water and detergent have made no impression, nor has trying to scrape it off manually, as it just sinks into the fabric. Glamorous hedonistic alternative lifestyle, part wev. Polyamory: The decadence. The orgies. The destruction of Western Civilisation. 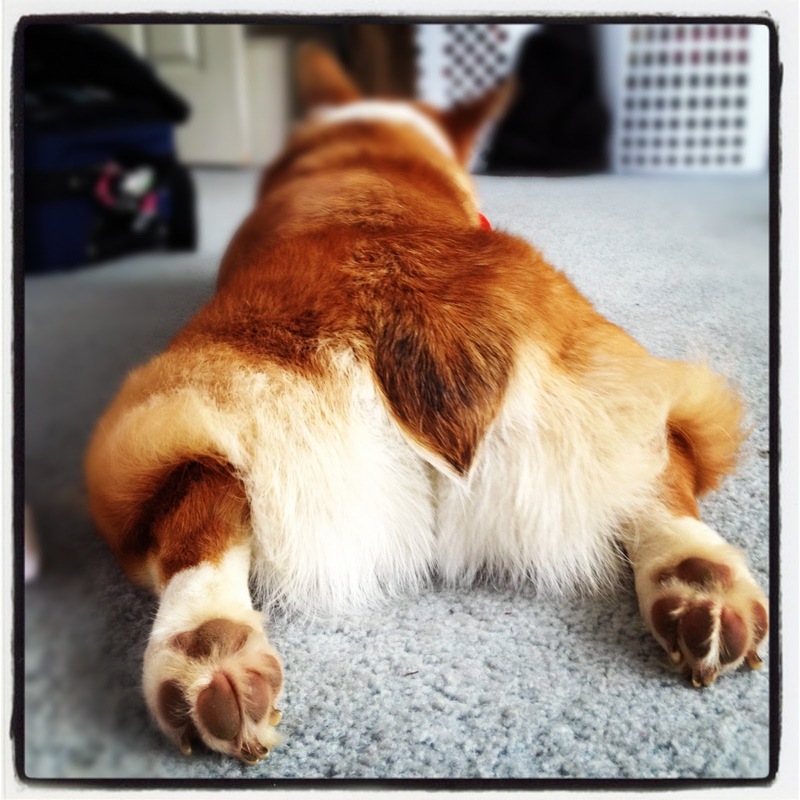 ... the butter-laden pile of corgipuke spattered across the arse of one's lover's shorts. Also, "Persistent Loss Of Corgulation" - a lost, early Pink Floyd album, and also what we are to watch for as a warning of any actual problems from this incident.